Extract - 20:1 ratio; T60™ water- soluble pollen extract concentrate. 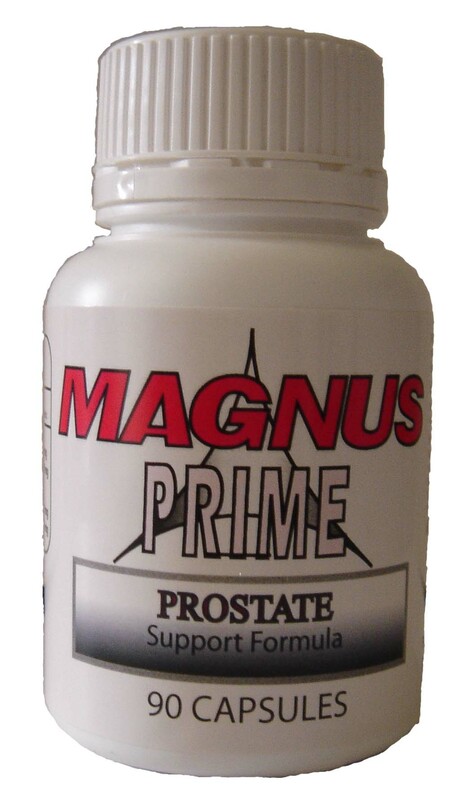 MAGNUS PRIME™ supports the body’s prostate gland and urinary system function through the benefits of SP63™. SP63™ is a combination of Standardized Flower Pollen Extract G60™ (a synergistic combination of over 39 vitamins, minerals, and caretenoids, 23 essential and non-essential amino acids, 98 enzymes, polar and neutral lipids, 20 fatty acids, prostaglandins, phytosterols, and long chain hydrocarbons), GFX™ and Standardized Saw Palmetto Extract (Serenoa Repens), Non Solvent Extracts. Clinical studies reveal that both extracts concentrate in the prostate gland to decrease the size and congestion at a cellular level. The fat soluble portions of the extracts are absorbed into the blood within 1-2 hours. Clinical studies using Standardized Flower Pollen Extract show that it reduces the size and congestion of prostate cells while urinary flow rate, and clearance are improved via the action on the smooth muscle tissue that lines the urinary system. At the end of a 26 week trial Standardized Saw Palmetto Extract was found to reduce BPH symptoms, including PSA levels and urinary flow rates by improving the hormonal metabolism of the prostate gland. MAGNUS SHIELD™ prostate formula contains Standardized Flower Pollen Extract G60™ and GFX™ that have been used successfully over past 50 years in America and Europe for Prostate treatment. Flower pollen is the male seed of flowers which enables flowering plants to reproduce. It is produced in the upper part, or anthers, of the flower. Pollen grains contain all the substances that are necessary to create new life within the world of plants. Like a sparkle of energy, creating new life is still a secret to us. Flower Pollen has a number of physiological effects that could benefit BPH. It has an anticongenstive-antiinflammatory action which could lessen external pressure on the urethra. Additionally Pharmacological effects reported for the pollen preparation are: influence on contactility of bladder, and influence on the metabolism of dihydrotestosterone.